Scrub potatoes and prick with a fork all over. Bake in a 425 oven for 40 t0 45 min or until tender; cool. Cut each potato lengthwise into 4 wedges. Scoop out the white portion of each potato wedge. Cover and chill the left over white portion for another use. In a small bowl combine the oil, chili powder, and hot pepper sauce. Using a pastry brush, brush the insides of the potato wedges with the oil mixture. Place the potato wedges in a single layer on a large baking sheet. Sprinkle wedges with mortadella, tomato, and green onion; top with cheese. Bake about 10 min more or until cheese melts and potatoes wedges are heated through. If desired, serve with plain yogurt or sour cream. Make-ahead directions: Prepare as above through step 3. 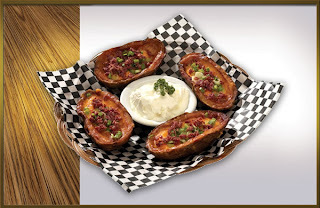 Cover; chill potato wedges for up to 24 hours. Uncover and bake as directed.